Affectionately (but not too affectionately) named by my carpool friend Margot, Mashed Potato is a White Holland, and weighed about 17 pounds yesterday. He and his 6 pen-mates have been living in her backyard for the last 20 weeks, and they’ll meet their end (at our hand) in two short days. Needless to say, there’s been some awkward Googling of “turkey slaughter” and repeated watching of this Sarah Palin clip (why won’t that guy get out of the way so we can see how he does that? 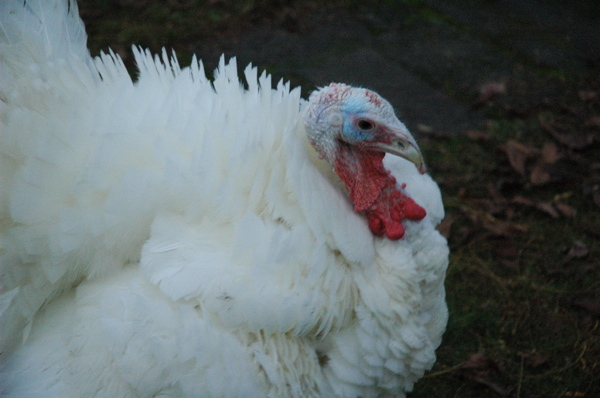 ), but when it comes right down to it, I think we’re all interested in participating in our Thanksgiving meal in a meaningful way and are treating the birds and the process with due respect. As currently planned, from the 21st of December to the 19th of January, I’ll be in: Boston, New York, Boston (again), Lexington Park (Maryland), DC, Seattle (briefly), Taipei (possibly), Hong Kong, Dongguan, Hong Kong (again), Los Angeles (LeiOut! ), and finally back home to Seattle. Yowsah! Overall, I’m pleased with the outcome of last week’s election: of course Obama, but also Chris Gregoire, the majority in the House and Senate, and the multitude of ballot initiatives that Washington voters managed to sort through and get right. Unfortunately, there was some collateral damage, most notably, Prop 8 in California. Though far from the first time a state wrote discrimination into its constitution, I think the passing of Prop 8 caught a lot of people off guard, California being generally regarded as a liberal state. Having been in San Francisco the weekend before the election, I knew the race was going to be a tight one, but that doesn’t make me any less unhappy with the result. It’s very disappointing that we’re not only not ready to accept gay relationships as equal to straight ones, but that we’re willing to take such a big step backwards and write into explicit law that discrimination. Given the general response here to the election (see this post), I’m hoping Seattle can muster a good showing at the upcoming Prop 8 protest. That’s where I’ll be tomorrow. Two editorials on Obama that caught my eye last Friday: one by David Brooks, the other by Paul Krugman. Both smart men, they have vastly different takes on how the president-elect should approach his upcoming term. We had Craft Day on Sunday, and also took the opportunity to officially rename it Crafternoon. I didn’t take photos, but folks were baking, decorating, sewing, knitting and debugging robot arm power supplies (which ultimately didn’t work, unfortunately). For a few weeks, I was doing really well at not being too busy. But then I took a couple of trips, with a visit from dad (which I enjoyed) sandwiched in between, and thing ramped up again. I’m starting to feel a little sick, which I’m taking as a sign that I’m not exercising quite enough and extending myself a little too much. Time to reel it in. I left a relatively small election night party in downtown Seattle last night to head up to a friend’s house on Capitol Hill, but never made it there. 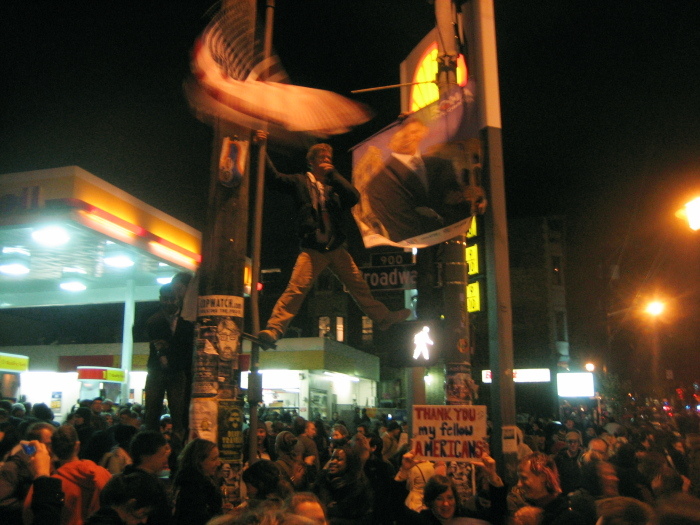 The atmosphere downtown around 9:30 was festive – Obama had won, and both he & McCain had given their speeches – but not much was going on beyond the honking passing cars and waving, cheering pedestrians. I hopped on the bus at 6th & Pike and made it about two blocks before we ran in to a couple hundred people marching down towards Pike Place Market. Along with a bunch of other folks, I got off the bus and joined the crowd in an impromptu parade. We hooted & hollered our way to 1st and Pike, dragging more and more people along with us, eventually meeting up with the crowd exiting The Stranger’s party at the Showbox. The mood was amazing and joyful and positive. Strangers high-fived and hugged each other, spontaneous chants of “Yes we can!” and “Obama!” sprung up, people carried signs or banged on makeshift drums, and there was dancing and laughing and crying. After a half hour or so, the crowd in front of the Market started dying down, and I made my way up to Capitol Hill, where I found an even bigger rally at Pike & Broadway. There were probably two or three thousand people in the streets making merry. I spent almost two hours there, cheering, congratulating, and running into friends in the crowd. It was hard to tear myself away, but sleep beckoned and I’d done all I really wanted to do. It should be noted that the police, while very much present at the rallies last night, kept their distance and were on their best behavior. They kept people safe (diverting traffic when necessary, etc. ), but allowed the revelry to continue without restriction. Well done, SPD. More pictures of the election night festivities in Seattle here, and some great photos of Obama from the past year or so are up on the Boston Globe’s Big Picture blog. Taipei was a whirlwind of a week: two days travel (one on either end), three days on the ground. I packed about as much into those three days as I could: visiting a college friend, eating all sorts of fried goodies, wandering neighborhoods, visiting bars & dancing ’til all hours at clubs, and, oh yeah, doing a bunch of work. It was a good time, if way too short. As previously mentioned, I didn’t have much warning about this trip, and I’m hoping the next one (January or so?) will afford the opportunity to spend an extra couple of days traveling somewhere in Asia. Tokyo appeals, in part because I’m already flying through there, so it’s just a matter of finding a hotel for a couple of nights and exploring. But I’ve also gotten recommendations for Thailand, the Philippines, and rural China. Nice to have so many awesome options! Before I learned about the Taiwan trip, I bought some tickets to visit friends in San Francisco over Halloween weekend. I might not have planned it that way if I’d known about the 30 hours I was going to spend on a plane the week prior, but it worked out just fine. Thanks to Laura & Alex for their amazing hospitality, and to the Make-Out Room for living up to its name. Finally, progress again on the robot arm! I found a power supply on eBay, and should be able to get back on the task of getting the motor drivers & control code up and running. From there, I’ll integrate Matt’s inverse kinematics code and see if I can’t get the whole arm moving around.